Thunderkick is a young developer established in 2012, yet it has been on the frontline of releasing unique and engaging slot games. The developer is responsible for hitmaker video slots in the market like Equeletto Explosivo, 1429 Uncharted Seas and The Rift. Thunderkick is widely known for crafting games with vibrant colours and appealing themes and a bunch of special features to boost chances to win. Fruit Warp slot is Thunderkick's 2014 release build with an innovative idea and modern technology. 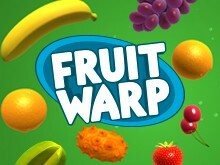 Contrary to other regular online slot games, Fruit Warp slot does not feature any reels. The fruits (representing the symbols) are suspended in space! Get immersed in a whirlwind of incredible prizes from your smartphones, tablets and personal computers and enjoy a high variance and a theoretical return to player (RTP) of 97%. At the first look, you may be tempted to conclude that Fruit Warp is all about fruits, but you will notice that it is sci-fi slot as you start playing. The storyline is about a warp distorting space and times leading to fruits appearing in a random order. The universe in Fruit Warp is very unpredictable and may work in your favour where you can win huge prizes. Before the game start, you will see a short intro video to entertain you as well as give you a glimpse of what you expect. The video clip also shows the seriousness of Thunderkick in creating this thrilling slot game. 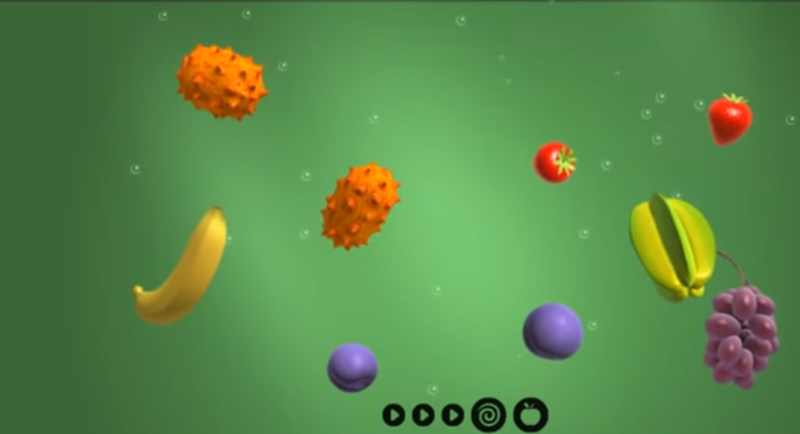 Upon hitting the minimal spin button, you will see an assortment of fruits including bananas and dragon fruits floating in the air. The 3D graphics and visual animations are engaging and of high end quality, and the colours bright and vibrant to make the game even more appealing. The game also features entertaining sound effects that blend perfectly with the theme. The game's betting options are arranged along the bottom of the screen for quick accessibility. If you are new to slot's world, then you might find the gameplay quite confusing. This sounds weird as slots are considered to be simple. But you dont have to worry so much, just watch for three or more fruit symbols of the same kind to showcase on your screen, and boom, you go! Even though there are no reels in Fruit Warp slot, you will find a couple of exciting features to benefit from. The betting range in this slot is from as little as $0.10 up to a maximum of $100 which can be adjusted by clicking on the Bet button. Another important button on the screen is the Autoplay which enables you to set between 5 and 5000 spins to play uninterruptedly. The smooth gameplay and 3D graphics allow you to enjoy the Autoplay mode as you relax and wait for your wins. Other options you expect to find on the screen include the Balance, Bets, Pays and Total wins. Fruit Warp slot has a total of nine symbols represented by different fruits. The fruits are available from the lowest paying like the cherries, a plum, an orange, a strawberry, a banana, a grape and a watermelon. The highest paying symbols you should keep an eye on is the Pitaya fruit which displays a value of (216.000, 54.00, 18.00, 6.00, 4.00, 2.00, 1.00) for a Cash Bet selection of $1. This gives a chance to win up to 216 times the wager on a single spin. Unfortunately, there are no scatter and wild symbols in Fruit Warp slot game, however, there is a bonus round to help you play more. Portal Re-spins: Land four symbols of the same kind to unlock this feature. Fruit Modes: Get five or more of the symbols of the same kind to trigger the Fruit Mode feature. Each symbol matching in the Fruit Mode game triggers 1 step in the Warp Meter. Note that some steps contain dynamic multipliers and extra lives. You will be granted a new respin when at least one symbol matches the Fruit Mode type unless the Warp Meter is filled. The Dynamic multipliers will increase in value for each win until they are activated and their value is locked. The number of symbols in a win determines the multiplier increment and is distributed from right to left as evenly as possible. An activated extra life rewards one extra re-spin if no symbol matches the Fruit Mode type. Extra lives spent do not grant any step increase. Fruit Warp is yet another fantastic video slot from the leading slots creator, Thunderkick. It features a hit frequency of 40%, meaning you expect to land more wins compared in other online slot games. Although the slot has a slightly different layout, you will find it fun to play from desktops, tablet or smartphone instantly. There is a choice for free play and real money depending on your needs. bCasino is a relatively new UK based online casino offering players with the chance to play Fruit Warp among other popular video slots from Thunderkick. We are in partnership with other well known software developers in the market such as NetEnt, Playson, Betsoft, NextGen Gaming and Evolution Gaming who supply us with the latest games and updates. bCasino is fully licensed by the UK Gambling Commission and utilizes the latest 128-bit SSL encryption technology to protect customer's personal details and online transactions. One thing that makes us unique from other operators is our generous welcome bonus of up to $1200 to all our new customers plus additional promotional offers to help them build their bankrolls. Gamble Responsibly.